In our previous article about Magnetic Cabinet Closures, we discussed a few ways neodymium magnets could be used as magnetic latches or closures for cabinet doors. We ended with a teaser about how neodymium magnets might be used to re-magnetize an old closure with a ceramic magnet to be as strong as it was when new. Let’s do it! We’ll show how a neodymium magnet can replace the weak or broken magnet. It's a simple, fast solution that’s stronger and won’t tend to demagnetize over time. For those with more technical interest, we’ll also demonstrate how to re-magnetize a ceramic magnet using a pair of neodymium magnets. We’ll stay focused on the cabinet closure for this example, but the advice applies to other re-magnetizing situations as well. We hear questions about remagnetize old magnets in magnetos, old engine ignition systems, audio speakers, motors and generators. The same methods hopefully apply to some of those magnets too. 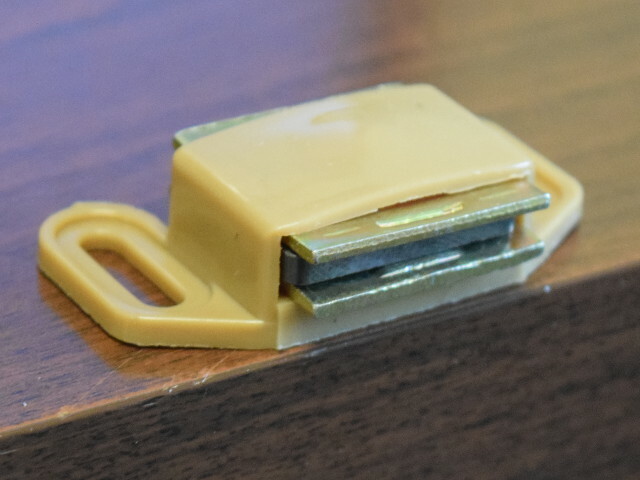 A common cabinet closure magnet uses a ceramic magnet sandwiched between two steel plates. They are cheap. The whole assembly cost $1.49, including screws and steel strike plate. They get the job done well enough. If the application doesn’t need a tiny magnet size, you can pick one big enough to do the job. The use of an assembly with steel plates improves the magnets strength and resistance to demagnetization enough to be usable. The ceramic magnet by itself is much too weak. 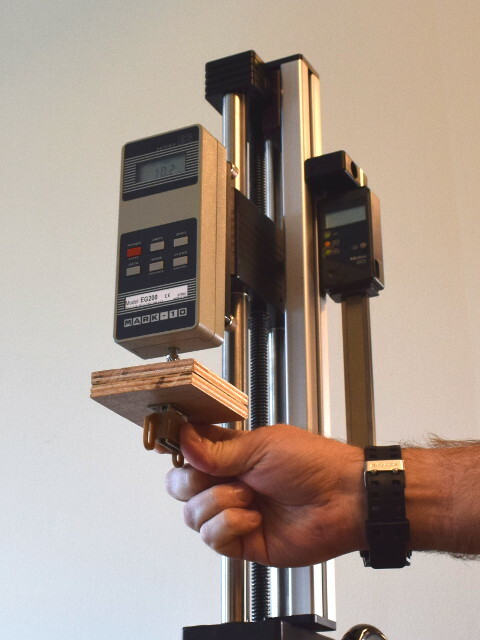 The ceramic magnet assembly pulled with 10 lb of force on our digital pull force gauge. To establish a baseline, we measured the pull force of the brand new magnet assembly at 10.4 lb. When we disassembled it to try measuring just the magnet alone, it provided only about 0.6 lb of pull force. That's not enough to be useful. Let’s replace the ceramic magnet: More Power! Take apart the old magnet assembly, and replace the ceramic magnet with a strong neodymium magnet! What happens if we simply replace the existing ceramic magnet with a neodymium magnet that's about the same size? Taking apart the assembly, we found a simple ceramic magnet that measured about 0.945" (24mm) x 0.709" (18mm) x 0.118" (3mm) thick, magnetized through the 0.118" (3mm) direction. When we measure the pull force of this magnet alone, without the assembly of a sandwich of steel plates surrounding it, it's surprisingly weak (0.6 lb pull force). 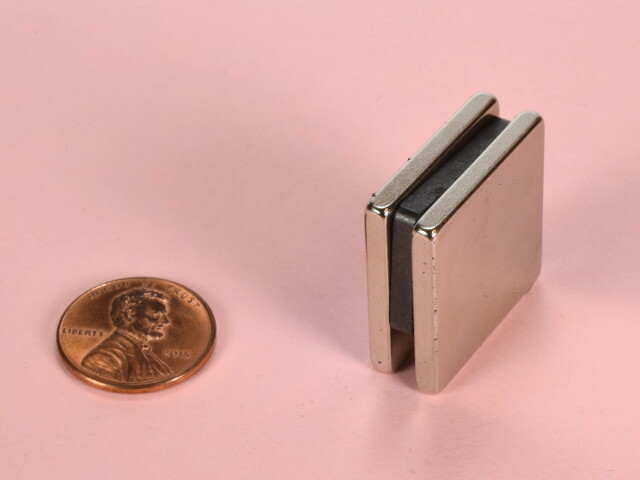 The stock BX0C2 magnet is just about the same size, at 1" x 3/4" x 1/8" thick. All by itself, it has a Pull Force, Case 1 of just over 12 lb. How will this magnet work within the assembly? It fit very well and worked great. It felt noticably stronger than the ceramic magnet when handling it. A careful pull force test showed that it pulls with 18-20 lb of pull force! That's a substantial improvement over the original 10.4 lb of pull force! We also tried a smaller, 1" x 1/2" x 1/8" thick BX082 with good results, yielding a pull force of about 14 lb. 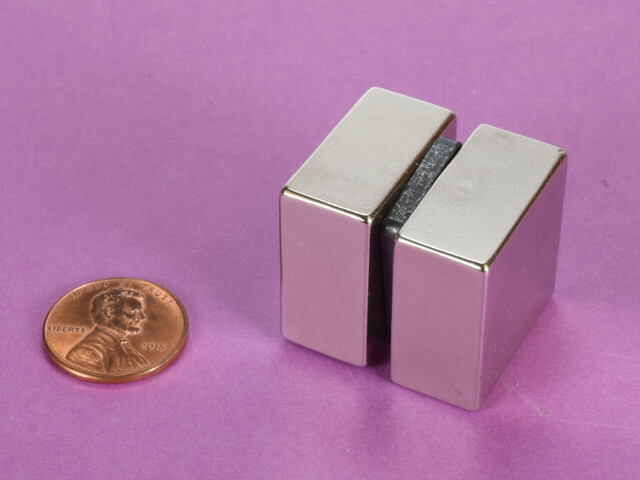 If you're getting a neodymium block magnet to repair your magnet assembly, be sure to pick one that's about the same size or slightly smaller so that it fits well. Short Answer: If you have a weak magnet assembly like this, substituting a neodymium magnet that's a similar size should provide good results. The pull force is likely to be greater than the old magnet, showing up to 2 times the strength. Even a slightly smaller neodymium magnet can work very well. Can you re-magnetize a weak ceramic magnet? Yes! In some cases, the old ceramic magnet has weakened or demagnetized over time. Can you use some neodymium magnets to re-magnetize it to its original strength? In many situations, the answer is yes. For this example of a cabinet closure, we’d recommend the simple solution of discarding the ceramic magnet and using a neodymium magnet. The neodymium magnet is a bit stronger, and won't tend to demagnetize. However, there are situations that aren’t so easily solved. With magnets in motors, generators or speakers, the rest of the assembly is carefully designed around the performance of the existing magnet. Simply replacing it with a more powerful one might not always be best solution. 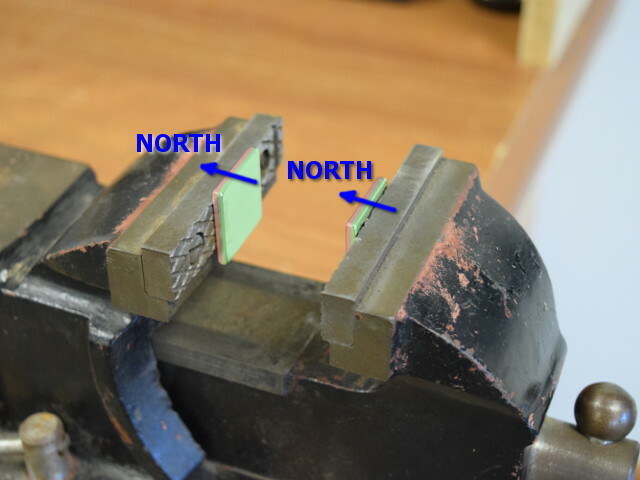 Proper magnetization direction for magnets set in a vise, to provide a strong, fairly uniform magnetic field in the gap. Two BX0X02 block magnets set in a vise, attracting towards one another. A ceramic magnet can be re-magnetized by exposing it to a strong, uniform magnetic field. Numbers vary, but we found that exposing it to a field strength of 8,000-10,000 gauss was enough to fully re-magnetize it. How do you generate such a strong field? If you read old literature on the subject, you’ll find lots of descriptions of machinery that is essentially an electromagnet: coils of wire, currents of electricity flowing through it, etc. Back in the days before rare-earth magnets were invented, this was the only way to do it. You would set the weak magnet inside a coil of wire, and run a strong current through the wire. Now, we can do it with strong neodymium magnets and avoid electricity entirely. A single neodymium magnet sitting on your desk won't provide a field strength that's quite strong enough. On some of our strongest magnets, you can find a field strength of perhaps 5,000 to 7,000 gauss on the surface. That's almost enough, but not quite. We can create a stronger magnetic field using two magnets separated by a gap. Our favorite solution used two 1” x 1” x 1/8” thick BX0X02 block magnets. We placed them on a steel vise with the poles oriented as shown. See our article about Which Pole is North for help identifying the poles of your magnets. Set in the vise, the magnets should be facing so that they attract towards one another, not repel. We chose this size because it is a little bit larger than the magnet we were re-magnetizing. Choose your own magnets accordingly. 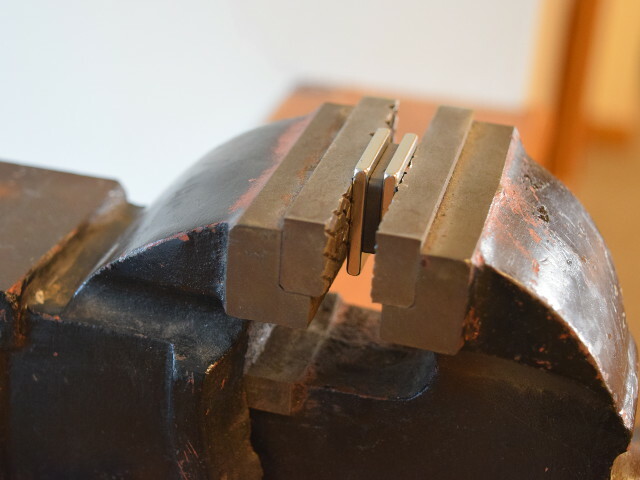 The vise is then closed together so that the ceramic magnet is sandwiched between the two neodymium magnets. This arrangement provides a very strong magnetic field in the center, inside the ceramic magnet. Our experiments show that we need a field strength of at least 8,000 to 10,000 gauss to fully magnetize a ceramic magnet. This kind of setup is described in more technical detail in our Gap Calculator article. The vise acts as a kind of “steel yoke” or return path as described there. Without a vise, you could do the same thing using just two magnets. However, you would need thicker, stronger magnets. We were able to re-magnetize the same magnet using two ½” thick BX0X08 blocks. We’d recommend the thinner magnets in the vise for several reasons: They’re less expensive, easier to handle (especially for folks unaccustomed to handling powerful neodymium magnets), and the setup with the vise works well in a repeatable way. In practice, the size of the magnets you choose depends on the size of the magnet you are trying to re-magnetize, how thick it is, and how much field strength is required to magnetize it. You could also pick thicker, stronger magnets like the BX0X04, but we wanted to highlight an example that worked with smaller magnets that are easier to handle. Our Gap Calculator can be used to help estimate the field strength in a gap between two magnets. It’s not a perfect calculation for the scenario described here, but it’s a great rough estimate. Why is it not accurate? For one thing, the Gap Calculator only considers disc magnets, not blocks. It also assumes that the gap between the magnets is filled with air, not another magnet. Still, plugging in similar numbers does provide some results that make sense. Here are a few specific examples from our attempts to re-magnetize this ceramic magnet. Two BX0X02 magnets with a ceramic magnet sandwiched between them. Not a good magnetizing solution. 1. In our first try, we took the two 1/8” thick BX0X02 magnets and sandwiched them around the ceramic magnet without the vise. It didn’t re-magnetize it; in fact, it de-magnetized it to practically no strength at all. According to the Gap Calculator, if I approximate the neo magnets as 1” diameter x 1/8” discs with a 1/8” gap between them, it estimates a field strength of just 2,869 gauss. That’s not enough. Note: We set the Distance field equal to the thickness of the ceramic magnet we're trying to re-magnetize. Two BX0X02 magnets set on a steel vise. 2. When we use the vise, which we might assume acts something like the “steel yoke” suggested by that calculator, the calculated field strength increases to 8,688 gauss. That number sounds much better. It did successfully re-magnetize the ceramic magnet. To remagnetize this ceramic magnet, a field strength of at least 8,000 gauss seemed to do the trick. Two powerful BX0X08 magnets, sandwiching a ceramic magnet. 3. When we tried thicker magnets without the vice (or yoke), it took ½” thick BX0X08 magnets to get the job done. What does the calculator suggest the field strength might be between two 1” diameter x ½” thick discs? 8,071 gauss. That number is very similar to what we estimated for the thinner magnets set in a steel vise. These also successfully re-magnetized the ceramic magnet. Unlike the arrangement with the vise, these magnets were harder to separate in a way that pulled them straight apart from one another. We had to shear them sideways just to get them apart. That may not be the best method for re-magnetizing the ceramic magnet. You can use this sort of estimation as a good start for your own re-magnetizing tasks.